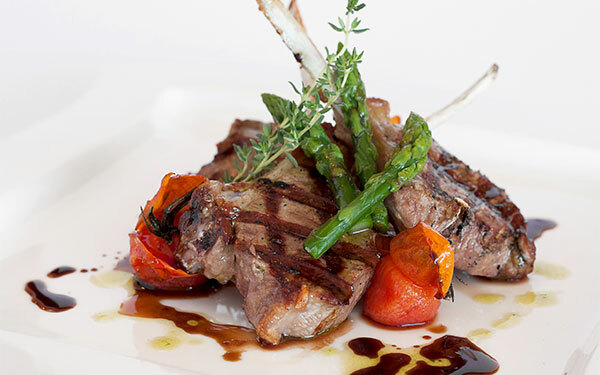 Check out the restaurants at Le Dune Resort, a Delphina collection 4-star resort in Badesi, in North Sardinia. 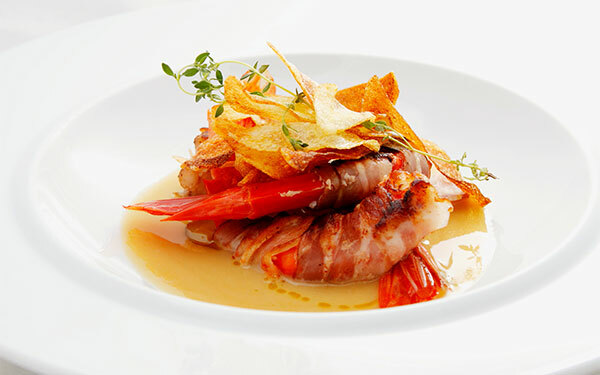 Delphina has always devoted particular attention to the pleasures of eating and drinking. 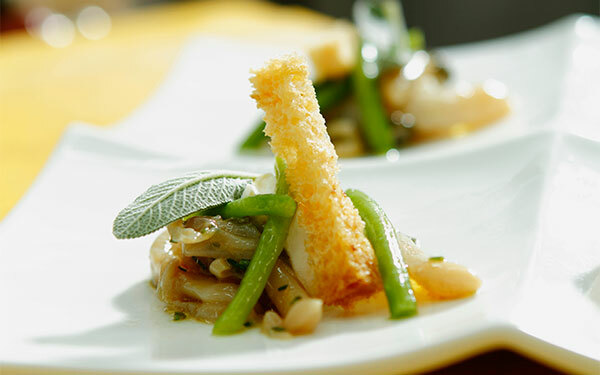 A careful selection of products from the island together with the freshest ingredients goes to create unrepeatable experiences of taste and flavour. 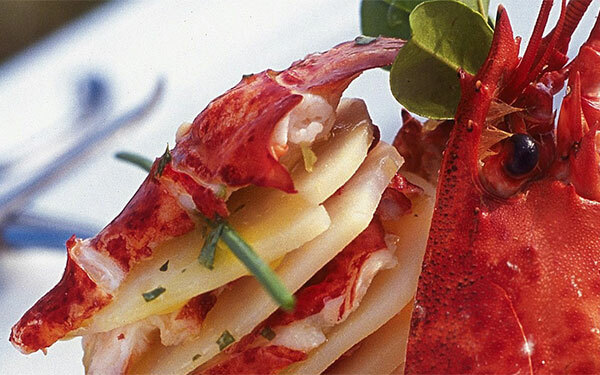 The freshest catch of the day in Sardinia comes to you directly from the harbours of Isola Rossa and Castelsardo. 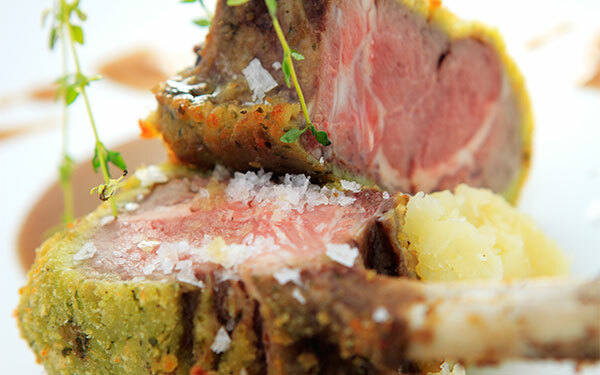 At the Resort Le Dune 10 restaurants to guarantee “haute cuisine” and a new experience every day. Genuine or zero Kms food and even eggs and vegetables from the Resort’s own organic vegetable garden are brought together with a careful selection from the nearby fields. The tastiest Gallura meat from Aggius and bread from traditional ovens provide a continual discovery of authentic tastes and smells. Natural spring water from the hills of Tempio Pausania and house wine included with meals (wine not included at the Romantico, Il Fico d’India, Il Leccio and Scorfano restaurants). 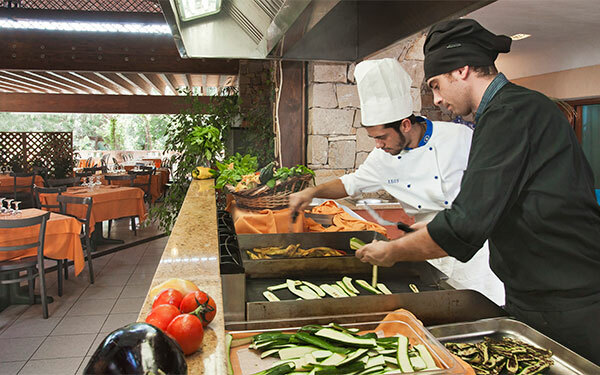 This is the resort’s main restaurant offering generous and tasty buffets of Mediterranean and international cuisine, Show Cooking for quick hot dishes prepared as you watch. 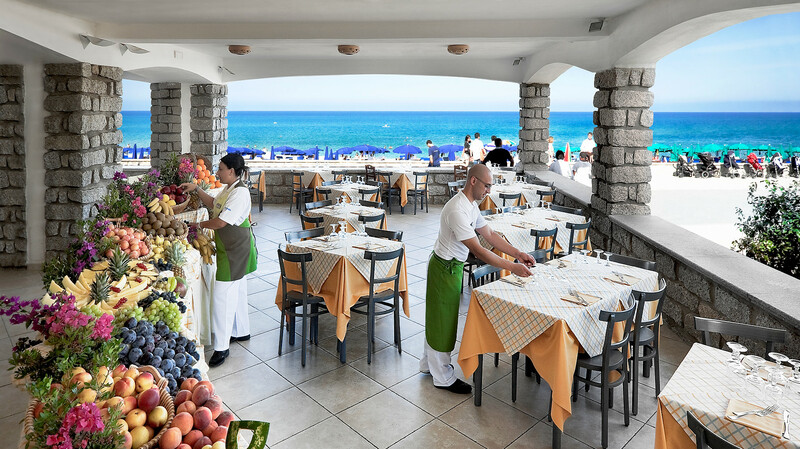 For lunch there is the Mediterranean Brunch®, a varied and delicious buffet with a wide choice of hot and cold first courses, imaginative salads, pulses, vegetables, cheeses and fresh fruit. Spring water and house wine included. Open for lunch from 12:30 pm to 2:30 pm and dinner from 7:30 pm to 10:00 pm. It is not necessary to book and there is no extra charge. Restaurant with buffet service. Spring water and house wine included. Open from 7:30 pm to 10:00 pm, booking required. No extra charge. 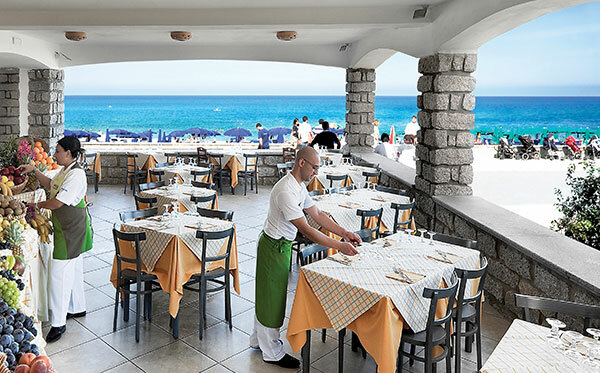 Fabulous restaurant with panoramic terrace a few metres from the Li Junchi beach, where at sunset you can enjoy delicious buffets with hors d’oeuvres, Mediterranean first courses, fresh fish specialities and fried sea food. 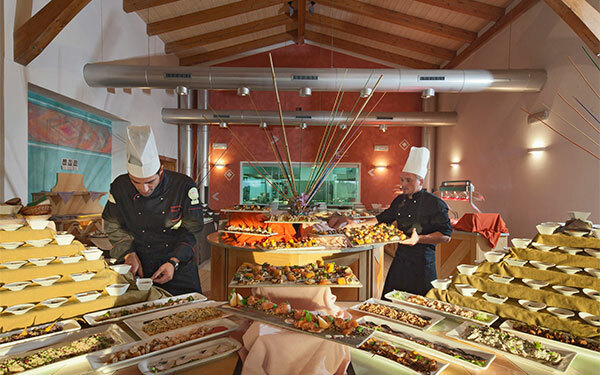 For lunch there is the Mediterranean Brunch®, a varied and delicious buffet so you can enjoy light dishes from a wide choice of hot and cold first courses, imaginative salads, pulses, vegetables, cheese and fresh fruit. Spring water and house wine included. Open at lunch from 12:30 pm to 2:30 pm and dinner from 7:30 pm to 10:00 pm, booking required. No extra charge. 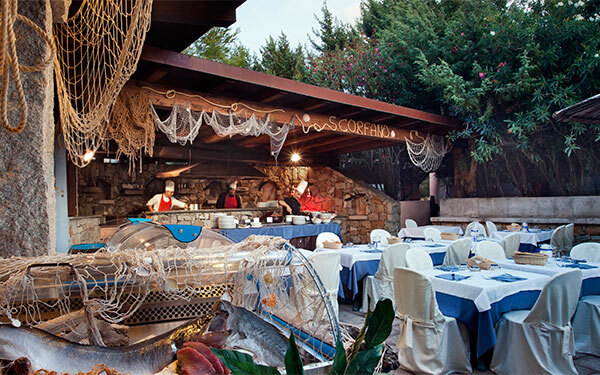 Restaurant dedicated to seafood specialities in a fishing village-style setting. 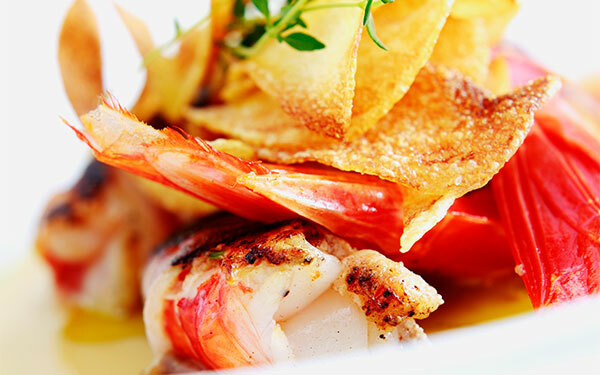 The restaurant has buffet service where you can enjoy delicious hors d’oeuvres, tasty first courses, fresh grilled fish dishes and desserts. Spring water included, wine to be paid for. Open from 7:30 pm to 10:00 pm, booking required. Extra charge of € 15 per person; free for guests at the Hotel La Duna Bianca and children aged from 0 to 1 year old. 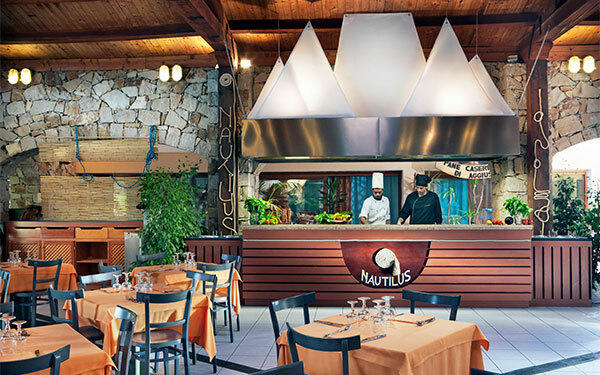 A restaurant in which to enjoy authentic Sardinian cuisine: generous buffets of typical dried meats, cold cuts and cheeses, starters, traditional first courses such as ciusoni, zuppa gallurese or the dessert known as seadas. Spit-roasted meat that comes from the pure Gallura fields including the famous suckling piglet, cooked as you watch over embers according to tradition. Spring water and house wine included. 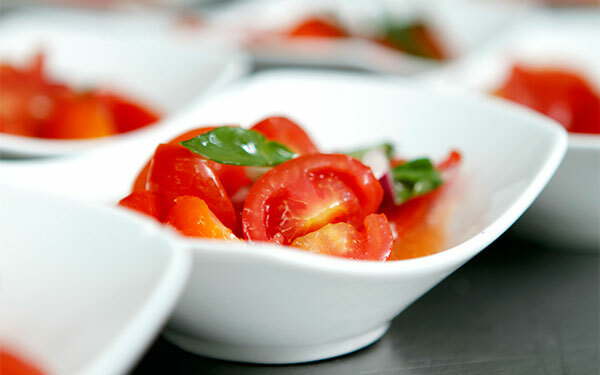 Buffet dinner from 7:30 pm to 10:00 pm, booking required. No extra charge. 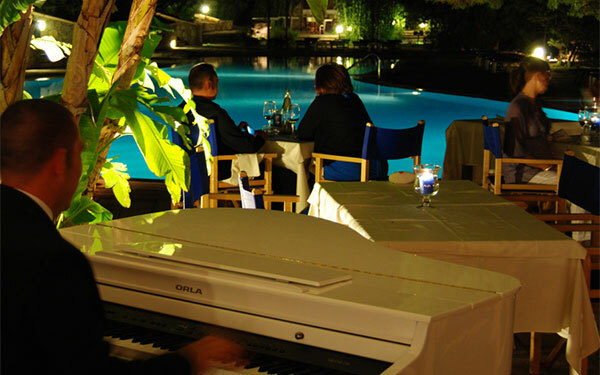 Restaurant with attentive waiter service in a romantic candle-lit setting facing the Hotel Le Rocce swimming pool featuring the chef’s specialities with theme-based tasting menù to enjoy with an excellent bottle of wine. Lobster (extra) directly from the aquarium. Spring water included, wine to be paid for. Open from 7:30 pm to 10:00 pm, booking required. Extra charge of € 15 per person, free for guests at the Hotel La Duna Bianca and children aged from 0 to 1 year old. Any extras are to be paid for. 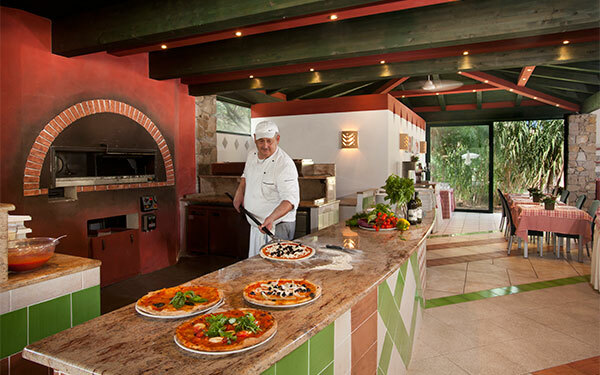 Offering specialities such as pizzas cooked in a wood-fired oven, spaghetti, starters and dessert for an informal evening. Spring water, house wine, beer and draft soft drinks included. Waiter service. Open from 7:30 pm to 10:00 pm, booking required. No extra charge. 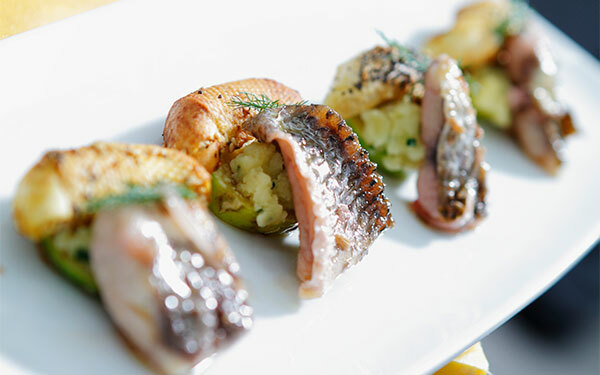 Intimate and elegant à la carte restaurant with chef’s specialities featuring meat and fish and offering attentive waiter service, reserved for guests over 14 years of age. Spring water included, wine to be paid for. Open from 7:30 pm to 10:00 pm, booking required. Extra charge of € 20 per person. 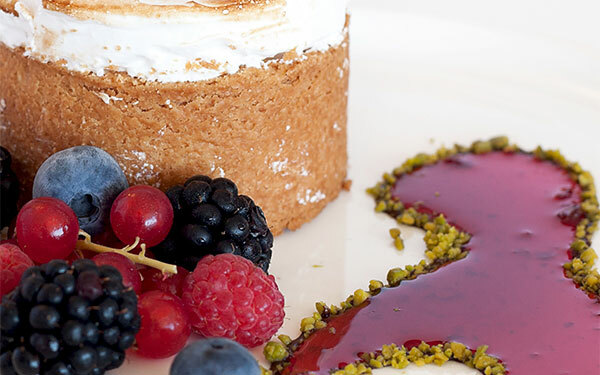 Elegant restaurant facing the Hotel Le Sabine swimming pool and offering buffet dinner with elegantly and carefully balanced dishes, theatrical Show Cooking for you to enjoy the best in quick hot Mediterranean cuisine. 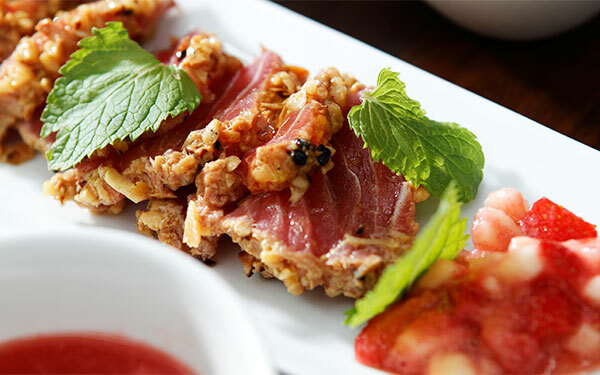 Hors d’oeuvers that are as delicious to look at as to taste, flavoursome first courses, meat and fish second courses and a generous variety of desserts. Spring water included, wine to be paid for. Open from 7:30 pm to 10:00 pm, booking required. Extra charge of € 12 per person, free for guests at the Le Sabine and La Duna Bianca hotels and children aged from 0 to 1 year old. Little dining room for the young guests of the Baby and Mini Club with spacious veranda and open both for the Mediterranean Brunch and for dinner featuring a constantly changing menù and tasty new dishes from our chefs using either genuine local products or zero Km products such as the vegetables and eggs that come from the resort’s organic vegetable garden and aviary and picked and collected by the children themselves. Open every day (except Saturday) for dinner from 7:00 pm to 8:00 pm (no extra charge) and for lunch from 12:30 pm to 1:30 pm (with extra charge for children on half board). Reservation required at Duneland. The assistance of one parent is required for children up to 2 years old.